To Cite: Caliskan S, Sungur M. Laparoscopic Stone Surgery: One Surgeon Experience, J Minim Invasive Surg Sci. 2017 ; 6(4):e62987. doi: 10.5812/minsurgery.62987. Background: Laparoscopic stone surgery has some advantages in the anatomical anomalies, comcominant of ureteropelvic junction obstruction and stone, symptomatic stone of diverticulosis, impacted large renal and ureteral stones. The results of the patients’ characteristics and complications who underwent laparoscopic surgery were evaluated and presented. Methods: The patients who were treated by laparoscopic surgery from January 2014 to June 2016 for ureteral and kidney stone were reviewed retrospectively. Transperitoneal method was performed in all patients. In this method; near 1 cm from the umbilicus was incised for to access the abdomen. CO2 was used to create pneumoperitoneum. Operation time, duration of hospitalization, the complications were recorded during and after the surgery. Results: There are 2 female and 5 male patients. The mean age of the patients and stone size was 46.28 + 15.52 years and 25.28 + 5.17 mm respectively. Average hospital stay was 4 + 3.94 days. There was no major complications such as bleeding, injury to internal organs during surgery. One patient (% 14.28) was converted to open surgery. The mean operation time of the remaining patients was 152 + 57.61 minutes. The stone free rate was 100%. Double j stent was inserted into four patient during the operation and one patient in postoperative period. The patients who underwent pyelolithotomy did not need stent placement. Percutaneous nephrostomy was performed in one patients because of prolonged drainage and ureteral stricture (16.66%) was detected in postoperative period. Conclusions: Laparoscopic stone surgery has a high succes rate. The urologist who were taken basic training of laparoscopy can be performed succesfully. Endoscopic stone treatment is widely used due to increased development of medical devices and surgical experience (1). Thetreatment modalities are extra-corporeal shock wave lithotripsy (ESWL), percutaneous nephrolithotomy (PNL) and ureterorenoscopy for urinary system stone diseases (2). The open surgery rate decreased to 5.4% and laparoscopy is an alternative method for the patients who are eligible for open surgery. European Association of Urology recommended that laparoscopy is an alternative method to open surgery for experienced surgeons (3). The indications for laparoscopic stone surgery are anatomical variants (pelvic and horseshoe kidneys), concomitant of ureteropelvic junction obstruction and stone, symptomatic stone of diverticulosis, use better adjective impacted renal and ureteral stones (2). 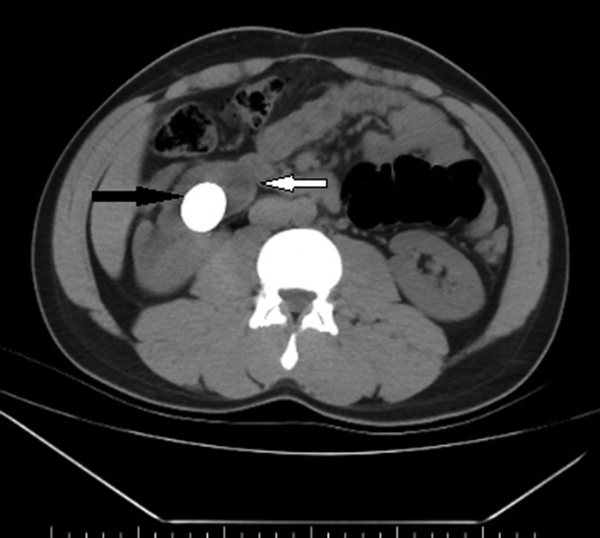 Residual stones and pushback of the stone can be seen after ureterorenoscopy procedures (1). The laparoscopic ureterolithotomy (LU) can prevent the pushback of the stone and residual stones. The PNL is suggested for staghorn and complex multiple kidney stones, laparoscopic surgery can be performed for the localization of the stone and ureteral anatomy and surgeon experience (2). The aim of this study was to investigate the patients characteristic and the results who underwent laparoscopic stone surgery in our department. ‘‘Seven patients were reviewed who were treated with laparoscopic methods between January 2014 ve June 2016, Corum’’Turkey retrospectively. patients entered the study with consent. The operation time, blood loss, conversion to open surgery and complications were recorded. All of the patients were underwent transperitoneal laparoscopic surgery in lateral decubitus position under general anesthesia. All of the operations were performed by one surgeon. Three trocars were used in 6 patients and four trocars were inserted in one patient because of adhesions of the abdomen. The open technique was used for pneumoperitoneum near the umbilicus with one centimeter. One of the trocars was placed in the subcostal area and the other trocar was placed between the spina iliaca anterior superior and umbilicus.monopolar and harmonic energy devices were used in the operations. After finding the ureter, stone location was dissected from tissues and the ureter was cut with knifes and L shaped hooc, the stone was taken from the ureter (Figure 1). Double j stent was inserted antegrately and the ureter was sutured with using 4.0 vicryl and drain was inserted. The data was expressed as mean + standard deviation value. Two patients were female and five were male. The mean age of the patients, stone size, hospital stay and operation time was 46.28 + 15.52 years, 25.28 + 5.17 mm, 4 + 3.94 day and 152 + 57.61 minutes. The blood loss was minimal in all patients. The conversion to open surgery was performed in one patient because of intrarenal pelvis. The LU and laparoscopic pyelolithotomy (Figure 2) was done in five patients and one patient respectively. The double j stent was placed in five patients and taken after 3 - 4 weeks from the operations. There was no wound infection in the patients and prolonged drainage was seen in one patient and the percutaneous nephrostomy was placed. The complications are shown in Table 1. Antegrate pyelography was done and ureteral stricture was detected. The patient refused the reoperation for ureteral stricture. The neuromuscular pain was seen in one patient. The use of laparoscopic surgery is increased because of the technological advancements (4). The advantages of laparoscopic surgery are lower analgesic treatment, lower blood loss, shorter hospital stay and better cosmetic results when comparing open surgery. 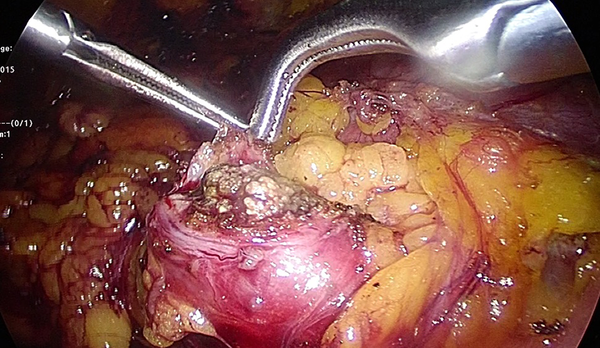 Urologic laparoscopic surgery can be performed with transperitoneal or retroperitoneal methods. While the wider working area and multiple landmarks are the advantages of transperitoneal technique, the disadvantage is risk of intra-abdominal visceral injury. In retroperitoneal technique; there is no risk of intra-abdominal visceral injury and easy performing for the patients who underwent open abdominal surgery, but limited and narrow area are the main cons in this approach. Laparoscopic techniques are dependent on surgeon experience and choice. The transperitoneal technique was performed in all patients and in one patient the operation time was too long (210 minutes) because of the adhesions of the abdomen caused by open surgery previously. Impacted ureteral stone is defined as no passing the guide and catheter or no changing the localization the stone during two months (5). The treatment choices in impacted stones are ESWL, ureterorenoscopy, PNL and laparoscopic surgery. The efficacy of ureterorenoscopy and ESWL treatment are controversial for big impacted stones in upper and middle ureter (6). The LU is alternative for open surgery and has similar surgical success when comparing open surgery. Less analgesic and short hospital stay are the main advantages of LU. The first retroperitoneal LU was performed by Wickham in 1979 (7) and Raboy et al. (8) performed the first transperitoneal LU in 1992. The studies demonstrated that LU is more successful than ureterorenoscopy and ESWL in big upper ureteral stones (9, 10). In the study of Ko et al. (9), the stone free rate was 93% and 68% in the patients who were treated with LU and ureterorenoscopy respectively. In another study, Neto et al. (10) reported the success of LU, ureterorenoscopy and ESWL was 93%, 62% and 35%. In this study the success rate was 100% and it is thought that the high success rate is associated with small patient group and selected cases. The mean operation time is different in the studies. Bayraktar et al. (4) found the operation time was 85 minutes, Kuyucu et al. (11) reported the mean operation time was 100 minutes. In the study of Sahin et al. (6) the mean operation time was 91 and 78 minutes in patients treated with transperitoneal and retroperitoneal methods respectively. The mean operation time was 152 minutes in the present study. In this study, the results show that low surgical experience is the main factor of long operation time. The prolonged urinary drainage and ureteral stricture are the complications of the LU (6). Some authors defined the Importance of double j stent and sutures (12, 13). Kijvikavi et al. (12) suggested only ureteral stent because of chronic inflammation in ureteral mucosa. The authors reported that there was no ureteral stricture in the series of 213 patients (6). In this study one patient had prolonged urinary drainage and ureteral stricture was detected. Both the double j stent and sutures were used in the patients, but the sutures were ineffective because of ureteral inflammation and edema. İmportance of laparascopic pyelolithotomy was known after the study of Gaur et al. (14). Laparoscopic pyelolithotomy is an alternative method for PNL. In a meta-analysis, the authors reported the advantages of laparoscopic pyelolithotomy was blood loss, fever and hemorrhage risks in postoperative period, PNL had advantages for operation time, short hospital stay. The mean operation time was 142 and 105 minutes in the study of Goel et al. (15) and Bayraktar et al. (6). One patient was treated with laparoscopicp pyelolithotomy and the operation time was 150 minutes in the present study. The main limitations of the current study are retrospective design and a small number of the patients. Lack of the long term follow up of the patients was the other limitation. There has been an increase in the use of laparoscopy in the world. Laparoscopic stone surgery is an alternative method in selected cases when the other treatments were unsuccessful or big impacted ureteral stones. 1. Fang YQ, Qiu JG, Wang DJ, Zhan HL, Situ J. Comparative study on ureteroscopic lithotripsy and laparoscopic ureterolithotomy for treatment of unilateral upper ureteral stones. Acta Cir Bras. 2012;27(3):266-70. [PubMed: 22460259]. 2. Ganpule AP, Prashant J, Desai MR. Laparoscopic and robot-assisted surgery in the management of urinary lithiasis. Arab J Urol. 2012;10(1):32-9. doi: 10.1016/j.aju.2011.12.003. [PubMed: 26558002]. 3. Urk C, Knoll T, Petrik A. EAU guidelines on urolithiasis. Vienna, Austria: European Association of Urology; 2011. 4. Bayraktar AM, Olcucuoglu E, Tastemur S, Sirin ME, Bicer S, Odabas O. Laparoskopik Urolojik Cerrahilerdeki Erken Donem Sonuclarımız: Ilk 32 vaka. Firat Tip Dergisi. 2014;19(2). 5. Karami H, Mazloomfard MM, Lotfi B, Alizadeh A, Javanmard B. Ultrasonography-guided PNL in comparison with laparoscopic ureterolithotomy in the management of large proximal ureteral stone. Int Braz J Urol. 2013;39(1):22-8. discussion 29. doi: 10.1590/S1677-5538.IBJU.2013.01.04. [PubMed: 23489513]. 6. Sahin S, Aras B, Eksi M, Sener NC, Tugcu V. Laparoscopic Ureterolithotomy. JSLS. 2016;20(1). doi: 10.4293/JSLS.2016.00004. [PubMed: 27019576]. 7. Wickham JEA. The surgical treatment of renal lithiasis. In: Urinary Calculus Disease. In: Wickham JEA, editor. . New York: Churchill Livingstone; 1979. p. 145-98. 8. Raboy A, Ferzli GS, Ioffreda R, Albert PS. Laparoscopic ureterolithotomy. Urology. 1992;39(3):223-5. [PubMed: 1532102]. 9. Ko YH, Kang SG, Park JY, Bae JH, Kang SH, Cho DY, et al. Laparoscopic ureterolithotomy as a primary modality for large proximal ureteral calculi: comparison to rigid ureteroscopic pneumatic lithotripsy. J Laparoendosc Adv Surg Tech A. 2011;21(1):7-13. doi: 10.1089/lap.2010.0340. [PubMed: 21190478]. 10. Neto ACL, Korkes F, Silva JL, Amarante RDM, Mattos ME, Tobias-Machado M, et al. Prospective randomized study of treatment of large proximal ureteral stones: extracorporeal shock wave lithotripsy versus ureterolithotripsy versus laparoscopy. J Urol. 2012;187(1):164-8. 11. Kuyucu F, Unal U, Evliyaoglu Y, Kartal B, Gurlen G, Gurbuz ZG. Ust ureter taslarinda retroperitoneal laparoskopik ureterolitotomi deneyimlerimiz. Adana Numune Egitim ve Arastırma Hastanesi Tip Dergisi. 2013;1(1):25-9. 12. Kijvikai K, Patcharatrakul S. Laparoscopic ureterolithotomy: its role and some controversial technical considerations. Int J Urol. 2006;13(3):206-10. doi: 10.1111/j.1442-2042.2006.01277.x. [PubMed: 16643610]. 13. Karami H, Javanmard B, Hasanzadeh-Hadah A, Mazloomfard MM, Lotfi B, Mohamadi R, et al. Is it necessary to place a Double J catheter after laparoscopic ureterolithotomy? A four-year experience. J Endourol. 2012;26(9):1183-6. doi: 10.1089/end.2012.0082. [PubMed: 22540150]. 14. Gaur DD, Agarwal DK, Purohit KC, Darshane AS. Retroperitoneal laparoscopic pyelolithotomy. J Urol. 1994;151(4):927-9. [PubMed: 8126827]. 15. Goel A, Hemal AK. Evaluation of role of retroperitoneoscopic pyelolithotomy and its comparison with percutaneous nephrolithotripsy. Int Urol Nephrol. 2003;35(1):73-6. [PubMed: 14620289].